Don’t drip your popsicle on the keyboard! 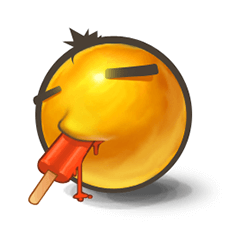 But you can post this cute emoticon to your wall or send it in chat for a laugh when you’re taking a time-out for a snack break! Have you checked out each gallery on our website yet? They’re filled with fun and clever emoticons like this one! You’ll never be bored on Facebook again!